Many Texans like wind power. Few want electric transmission lines running through their ranches. That's the difficulty facing the state's energy regulators as they set about approving routes for nearly $5 billion worth of new wires across Central and West Texas. The lines are key to the state's aggressive promotion of wind power, because they will allow more clean electricity to travel from breezy western mesas to big cities. But property-owner frustration was evident earlier this month at a jam-packed meeting of the Public Utility Commission, which convened to authorize routes for Oncor, a Dallas-based company that will build some of the lines. "The aesthetics are a big deal," said Mike Terhune, a retired military first sergeant, who joined the audience to see whether his five acres of land in Bell County would end up along one of the routes. The wires, he noted, will hurt property values. Ultimately, Terhune's neighborhood was spared; the route went another way. But many other landowners will not be so lucky — and the consequences can be severe. One man told the utility commission that he would have to move if the route went through his property, because his wife would refuse to live there. Plans for a new batch of transmission lines to aid wind power got a key go-ahead in 2008, when the commission voted to approve a $4.93 billion transmission project to aid wind power. The project is known as Competitive Renewable Energy Zones, which refers to the mapping of windy areas in West Texas, from which more than 2,300 miles of transmission lines will be built. 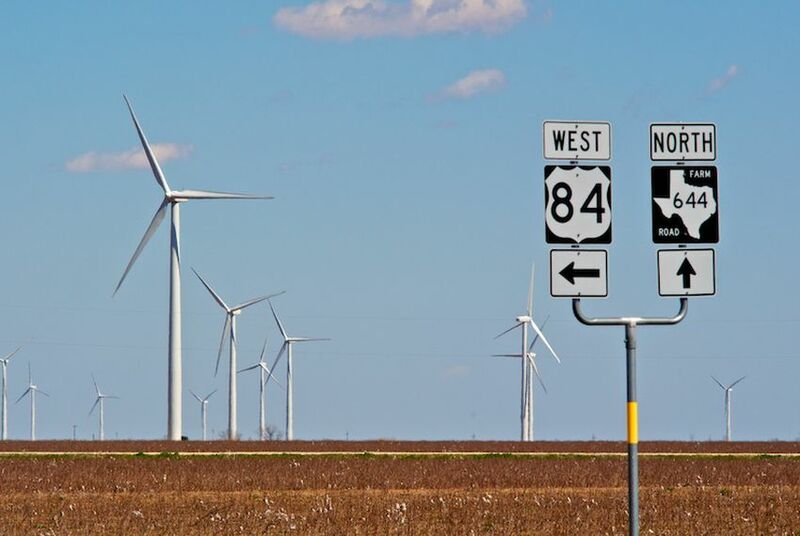 Wind developers say that new lines are badly needed for Texas, which already has far more turbines than any other state, to maintain and stretch its lead. So many turbines have already gone up in Texas — the state just passed the 10,000-megawatt mark — that on windy days, some turbines must be stopped or slowed because there are not enough wires to carry the power to population centers. The problems center on West Texas, home to nearly 90 percent of the state's wind capacity. Last year, the commission named the transmission operators that would build the lines — including Oncor, which was given the largest segment. The companies will pay the construction costs up front and later recover their investment from ratepayers. The discussion now centers on the particulars of the routes. The transmission companies have submitted proposals, and the commission makes the final determination. The companies can negotiate an easement with landowners along the route. Failing that, they can take the land through eminent domain, in accordance with Texas law. But myriad obstacles block each possible route, as the crowd packing the commission meeting showed. Far from being empty land, rural Texas is stocked with private airfields, groves of old pecan trees, military bases, archaeological sites and at least one pocket of unexploded ordnance from an old military site. There are also rivers, bayous and catfish ponds, as well as bald eagles and other fragile species. "The truth is, there is almost never a perfect solution," said Donna Nelson, one of the commissioners, at the April 1 meeting. Even Oncor lawyer Allen Nye, Jr., acknowledged that choosing transmission routes is "very much an art, not a science." The three commissioners, appointed by the governor, seemed inclined to respect property lines and to prevent Oncor from cutting through people's land if the wires could hug the boundaries instead. Before a large crowd — many of whom lived along potential Oncor routes — the commissioners pored over maps and satellite photographs before coming to a decision. More meetings, for additional routes proposed by other transmission companies, are on the commission's agenda in the coming weeks. National think-tank types, most recently at the Milken Institute, argue that Texas' plans for wind transmission could set an example for the rest of the country. But some landowners say that the Texas process has been flawed from the beginning. Amy Thompson, whose family's ranch in Mills County lies along one of Oncor's routes, said the information sent out to land owners was perplexing to her and her neighbors. "I have an advanced degree in planning, and I have to read these things three times," she said during a break in the proceedings. After Thompson, as well as her cousin, spoke up at the recent commission meeting, the commissioners instructed Oncor to work out a deal with her family to "follow fence lines and roadways instead of going right through our property," she said. But she feels for her neighbors, who did not get involved early enough in the process to have their concerns addressed. "The commissioners didn't direct Oncor to make the same accommodations for them," Thompson said.